About a week-and-a-half ago, a friend asked to borrow one of my Brooklyn unnameable acquisitions after I was finished reading it. The desire stemmed from an Instagram picture, which was incorporated into a previous post of mine: No Bananas. No, it’s not the same picture listed below, but this follow-up is from the same The Crack-Up. 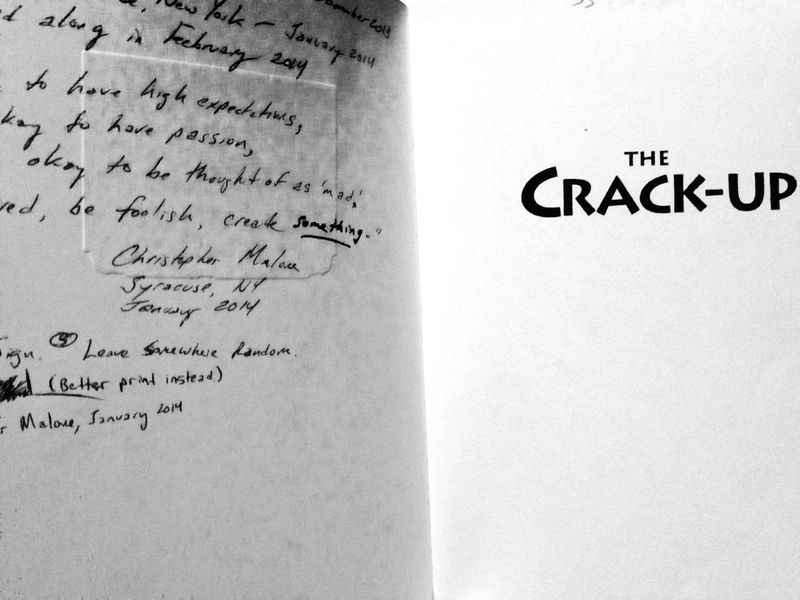 “The Crack-Up” is actually a title of one of F. Scott Fitzgerald’s essays, one most definitely criticized. The content–I’m not going to get into it, because why spoil a good essay? Make you work for it–read it, of course–that seems more appropriate. However, the book of the same name is a compilation by Edmund Wilson, and it contains essays and observations and tidbits and letters dating from the 1920’s up to Fitzgerald’s death in 1940. And the book called out to me on one of the shelves of Unnameable Books in Brooklyn this past December. For the low price of seven dollars, the paperback was mine for the taking and enjoying. Indulging was a necessity; sometimes reading slow is purposeful, because you want to take a lot of of the text. Therefore, this slow course of reading was carried out. 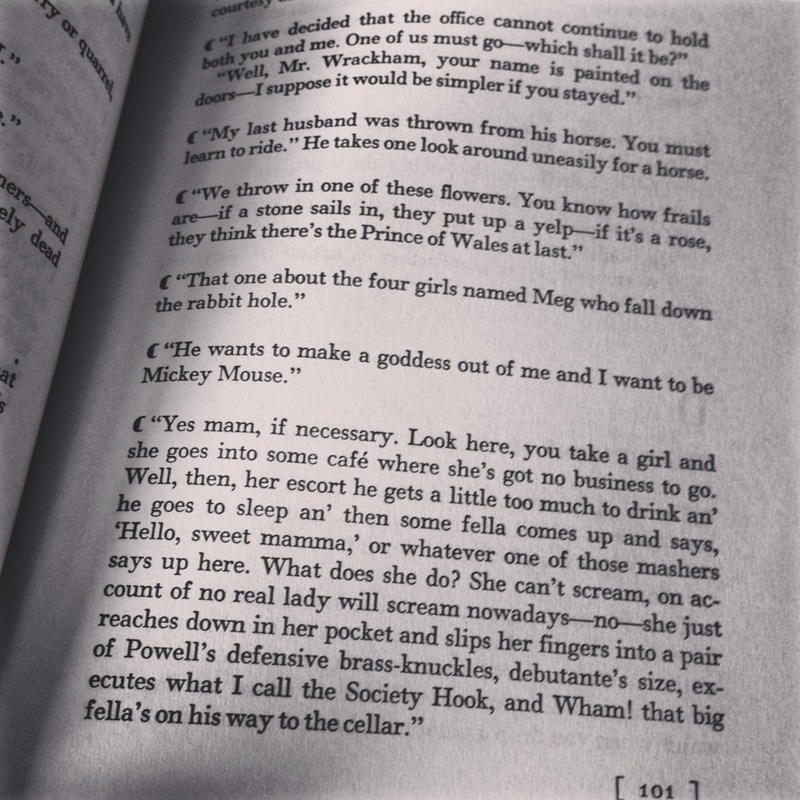 In the section with Fitzgerald’s notes and observations, it’s important to not read everything quickly; these pages, a great portion of the book, is not intended to read like a novel. You’ll miss some really witty one-liners. At the half-way point, give or take a few pages, I knew this book did not belong to me. It’s not supposed to be kept or hoarded. That’s probably the reason why I’ve never seen it at a mainstream bookstore or library before. It was decided to send the book off to another and the next reader. There is no intention on getting this copy back. If it falls in my hands again, it does. I’m not going to keep it though. I’ll sign my name again, write a note, and put it somewhere random. So, I am sorry for all of you who may have wanted to borrow this book of Non-fiction; it’s going to be somewhere in New York state. It should linger for a while, but no promises or time expectancy can be determined at this point. I scribbled in the inside. It’s okay to be though of as mad. Call me crazy for trying this. You could dislike this, because this bologna was attempted in Serendipity for a completely different reason. Exactly–a different reason. What if the book were to end up in my possession again? What if names are printed on the inside? It was stated after to print instead–realize my name is printed and my signature is below it… kind of dangerous, eh? We already have doppelgangers, we don’t need full-blown impersonators. With the package, I’m sending Carrie a note, telling her to read, sign, and leave in a random spot. It’s up to her whether or not she stands or tapes a sign that reads free on it. As long as she gets rid of it. She can hold on to it if she likes. This isn’t for me to say. The Crack-Up really isn’t one of those books you’d hold on to. The paperback is beat, pages creased, and now some dreamer just wrote on the inside cover. Mark and I had a nice quick thread, and he says this is good karma; he did something along the same lines, and I’m sure there is curiosity surrounding the readers of Star Island by Carl Hiaasen on the boat that is Pride of America as to Who left it? and Why? It’s important to see fellow readers, writers, artists, dreamers, etc. take something from this. It’s emotional. It’s relevant. It’s powerful. It’s downright humorous. How Fitzgerald, Wilson, Passos, Bishop, Wharton, Wolfe, Eliot, Stein, and Westcott write in essays and (simply) letters is downright beautiful. How they speak/write. their phrasing, is fascinating to me, because this is something I’m never going to accomplish in my lifetime. Whoever will pick this up should (hopefully) take something away from it. If not, well, sign your name and leave it somewhere. Thou shall not burn thy book: instant bad karma. This book is out of my hands. It’s going to be given to you for reasons I cannot understand, but for you to decide. But writing is all about finding your own voice, and mine (my tone as well) has changed evolved. I think it’s changed matured for the better. This is my gift to the world: a bunch words that translate into something. After Monday night, it’s obvious there is something afoot. Things do happen for a reason, it seems. Let’s put it this way, there was complete disbelief on my end. It started out as deja vu and dreams that just so happened to parallel life. It started with Salisbury Cathedral in England, 2007. A handful of years back it was described as Well, isn’t that funny. Then life became more elaborate. The funny situations turned into Huh. situations (yes, with a period). The Huh. eventually turned into my realizing that paying more attention would be probably for the best, and others reminded me of this. Being passive and a doofus, to put it plainly, came very natural. The ukulele scene on How I Met Your Mother–icing. I give myself agita sometimes. Since turning 30, it’s been a hell of a year. It’s been a transitional year. It’s been awesome. It’s been miserable and it’s been happy–smiling through all extremes. However, it’s ending. What the hell is next? At least some fun is to be had, getting it out of life. OK brother, soon as i post this comment, my next stop is Amazon to find a used copy. if you are that passionate about the book, it must be great. thanks for the recommendation. You are welcome, sir. Hope things are well on your end, and stay warm. I feel awful about all the craziness the cold weather is causing down south. oh, it’s not too bad where i’m at, but thanks for your concern. 1. Your chain-booking is simply awesome. I think it shall cause much Serendipity of its own momentum. 2. I do believe I was using a business card as a bookmark while reading said Hiaasen novel, and left it in ‘Star Island’ for its continued journey through the Hawaiian islands. A piece of Syracuse, N.Y., on the deck chairs, in the sun. 3. Happy 31st birthday, Chris. May the new age bring you continued wonder. Thanks for the support, Mark! Hopefully the book travels far. We’re alike in the sense we use business cards as bookmarks, by the way. Thanks for the birthday wish in advance. I have another month and 13 or 14 days or so. I’m counting them down. Your sense of impending age increase was palpable in your post, Chris. Enjoy the waning days of 30.